Thank you to Alec for joining me on this almost-8-mile walk (roundtrip), after I told him we'd probably be walking for only 4 miles. 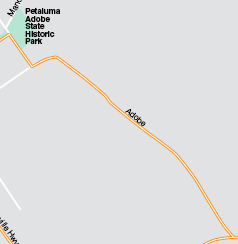 We walked along Adobe Road (between Petaluma Adobe State Historic Park and Stage Gulch Rd.). To be fair, we did stop by a farm stand to check out their produce; but this accounted for only a small fraction of the extra distance. I had simply mistaken this stretch of road/trail with another upcoming segment. Good thing we made it back by dark. Petaluma has some beautiful farm countryside. The red-winged blackbirds were out in force defending their nesting grounds. And Petaluma is winning the prize for the-most-reptiles- sighted-in-one-city (so far) contest. There was a very healthy population of lizards darting about. Unfortunately, the 4 snakes we saw were all roadkill. And we saw a few animal skeletons, something I haven't seen in more developed suburbs/cities. We were left to guess what types of animals they might have been. It's that whole cycle of life thing. We passed farms, vineyards, and cow and sheep pastures along the way. One cow (#4) had what appeared to be a perfect heart-shaped spot on its forehead (shown below right). Overall, some cows we passed were friendly and curious; they watched us from inside their fenced area(s). Others seemed to want to retreat to higher ground. I don't think these animals see pedestrians walking on this road very often.